Is Your Child A Late Talker? · Are they quiet? · Seem shy? · Not talking like their peers? · Allow you or siblings to speak for them? · Do you wonder why? Your baby’s babbling and toddlers first words can be music to your ears. 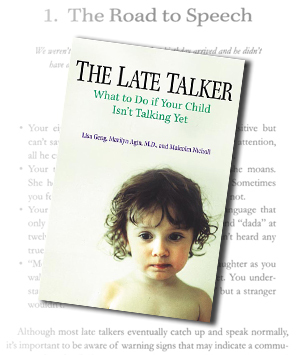 When faced with a child who doesn’t speak or seems to have difficulty with words parents are often told that their child is “just a late-talker.” Unfortunately, all too often, that is not the case. The American Speech and Hearing Association (ASHA) estimates that 16 million Americans under the age of eighteen have a chronic speech-language disorder and that some 45 million Americans are affected by communication disorders of one kind or another which was announded by Congresswoman Carolyn McCarthy during the kick-off of the Better Hearing and Speech Month Health Fair in Washington, DC on May 8, 2002 . To find out about your nearest Early Intervention program you should call your local school district, they will be able to refer you to the program appropriate for your child’s age. Waiting to refer is a loss of precious time that may impact on the child’s learning ability and social-emotional well being in later years. Pediatricians and parents should insist on a speech and hearing evaluation as soon as there is a real concern about a child’s early language development. Early referral is endorsed by the American Academy of Pediatrics, and the American Academy of Neurology. 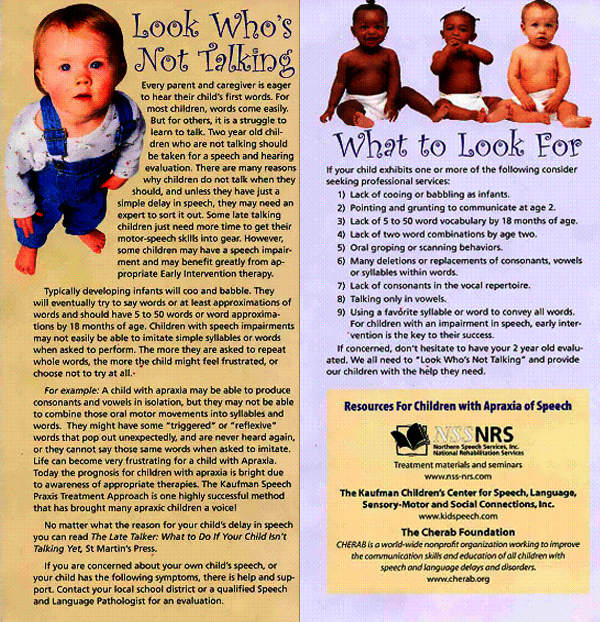 In addition, “any child with a severe speech/language delay should have a comprehensive health and neurologic assessment to look for medical conditions that may be causing or contributing to the delay” as Dr.Marilyn Agin says, a developmental pediatrician who is the Medical Director for Early Intervention for NYC. CHERAB is a non-profit foundation that focuses on raising awareness of Apraxia and other speech and language delays, and the importance of early intervention. Working with developmental pediatricians, speech pathologists, neuroscientists and major hospitals the CHERAB Foundation is working towards research on therapies which may help late talkers with Apraxia, Dysarthria, delayed language development, Autism and other speech and language impairments. A list-serv overseen by pediatricians, speech-language pathologists, and educational consultants is run by CHERAB and can be found at their web-site. Through the list you can connect to many other parents who have children who have speech or language delays, and find out what they have been able to do to help their child. Some speech disorders can overlap, or be misdiagnosed. For example, “Verbal apraxia, a disorder of central nervous system (CNS) processing, and dysarthria, a disorder of output, are commonly confused”, says Dr. Andrew Morgan, chief of child development at the Chicago College of Medicine. “Experts are able to differentiate between these two disorders by listening carefully to a child’s speech and by identifying certain physical clues”, says Dr. Morgan, but adds, “These disorders are poorly understood by physicians and by a lot of speech therapists as well.” It is possible for phonological disorders, apraxia and dysarthria to all occur together in the same child. Speech Language Impairments, which is connected to language based learning difficulties may also be present. And the severity of each may vary. Apraxia is perhaps the most misunderstood of all the speech disorders. So, what is apraxia? Verbal Apraxia is a neurological motor speech impairment that involves a breakdown in the transmission of messages from the brain to the muscles in the jaw, cheeks, lips, tongue and palate that facilitate speech. There is no obvious weakness in these muscles and the child may well be able to move them quite happily when not trying to speak. Apraxic children, who are usually seen as “just late talkers” when young, are able to comprehend language at an age appropriate level, however have difficulty expressing themselves using speech. With apraxia, a child knows what he wants to say but there is a road block obstructing the signal from the brain to the mouth. For any child with a speech disorder, but especially with apraxia, the earlier therapy is begun, the better the results for your child and their social-emotional development. So how do you know when your child is having problems with speaking? When is a good time to seek out help? Being aware of average speech milestones can also help you decide whether or not to speak to your doctor. Some guidelines are provided here for your information, but if you have concerns about your child’s speech or language development, or any other developmental issue, make an appointment with your pediatrician so you can discuss these issues. While the average milestones are a good way to measure development, every child develops at their own pace, and this overview should not be used to diagnose a specific problem. · No babbling or pointing or other gestures by twelve months · No single words by sixteen months · No two-word spontaneous phrases by twenty-four months · Any loss of any language or social skills at any age. Early feeding problems could be a sign of later speech challenges. The same muscles that are used for eating are used for speaking. A baby that has trouble nursing could be a early sign that the baby has muscle weakness in the oral motor area for example. If oral-motor difficulties are present your child should have an evaluation by a pediatric medical and oral motor speech expert to determine the cause and best therapy to possibly prevent some future speech problems. A few possible signs of oral-motor problems are outlined next. Does your child have difficulties with any of the following? When trying to speak does your child? errors, disordered syntax · Make up sign language, or show frustrations when not understood? ← Preview of ‘Nobody Ever Told Me (or My Mother) That! I am a mother desperately seeking help for my 6yr old son who has asd. He doesn’t not speak and I pray to god to send help everyday. Help me help him please. I am doing research on what type of fish oil to give him and am needing the name of a brand you trust. I would really appreciate it. Thanks . Hi Yolanda! If your son is 6 years old I’m guessing he’s already in therapy and special needs placement. Do you know if there is any underlying speech impairment? Some of the therapies used for autism such as ABA are not appropriate to address certain speech impairments like apraxia, which is a motor planning impairment. Again though there is probably so much more to help you with. First off to make sure your child has an accurate diagnosis (in other words – if you don’t know find out if there is a speech impairment going on) And once you know you have secured an accurate diagnosis, then you can make sure that your son is getting appropriate therapy, and placement. As a rule of thumb if there is no progress in 3 months, one should reevaluate therapy, therapist, and/or diagnosis. Hope that helps, and again please join one of our support groups! There is so much hope!